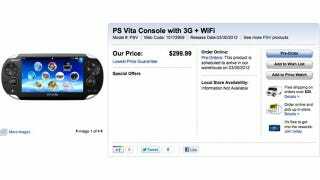 Playstation Vita Is Finally Up for Pre-Order... in Canada? Engadget is showing off a new Playstation Vita ready to be pre-ordered at Best Buy, but in the Great White North. The dates indicate a March 2012 release. Meanwhile, the UK can expect the console to drop on October 28.